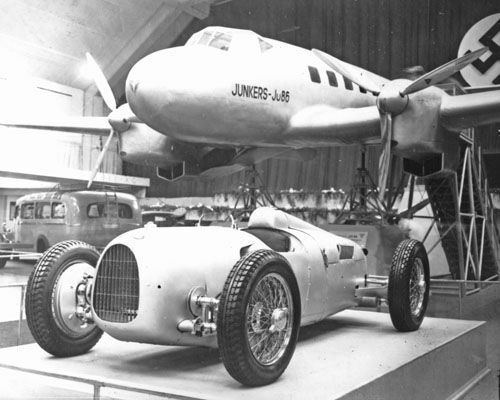 Imagine it’s 1936 and you’re a Japanese engineer with a passion for sleek aircraft and fast automobiles. 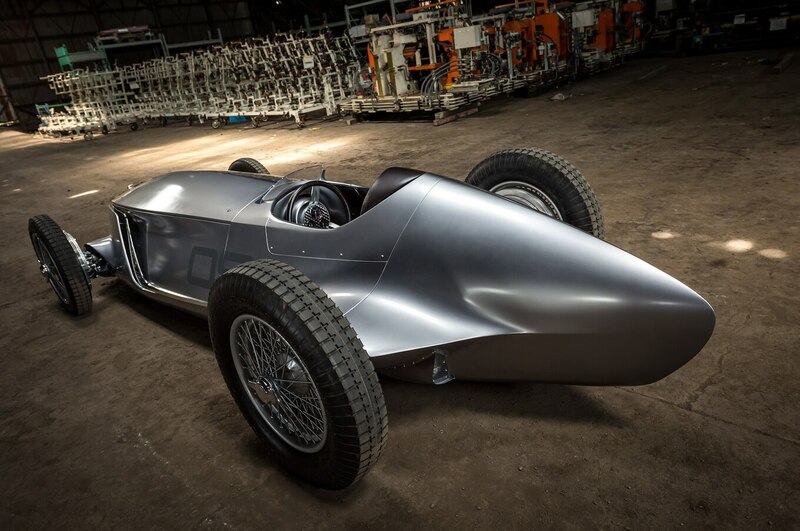 Imagine you’ve just seen, for the very first time, a low-slung Mercedes-Benz W25 grand prix racer, one of the original Silver Arrows. And then imagine what you’d want to do next. 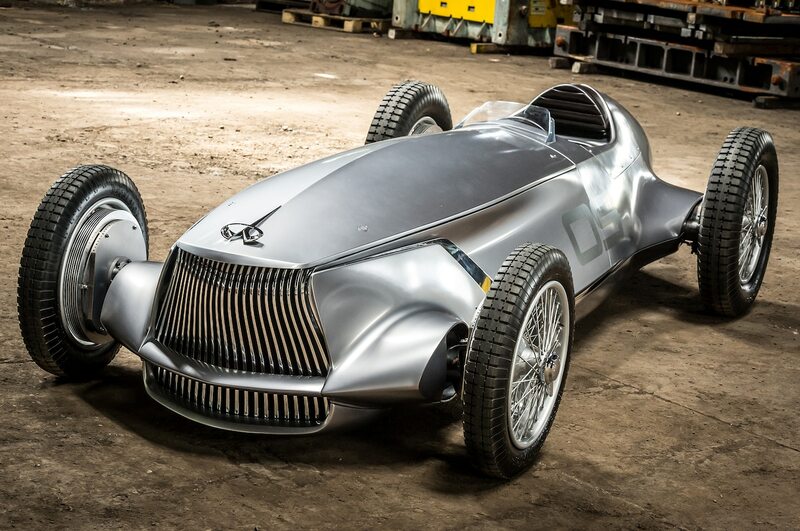 Infiniti has turned that thought experiment into reality with the intriguing Prototype 9. On the surface, the Infiniti Prototype 9 seems little more than a whimsical what if, a designer’s doodle made into metal, maybe even a brazen attempt to build a creation legend for an automaker that didn’t even exist until a half a century after the era that defines its form. But like a samurai sword, the Prototype 9 is an object made up of hidden layers, wrapped in meaning. 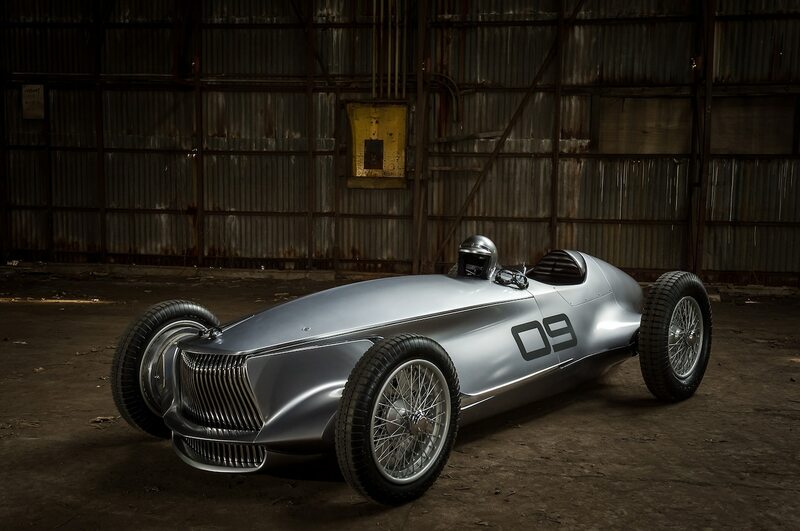 From certain angles the Prototype 9 looks like a simple mashup: vintage Mercedes-Benz racer meets Infiniti design cues. All the Infiniti identity is at the front—the double-arch grille, the shark gills aft of the front wheels, the single crease hood, and the pronounced bone lines running back to the cockpit— and it’s all executed in the 1930s idiom. Improbable as that might sound, it works, though a real racer would have eschewed the chrome trim and that Infiniti logo standing proud on the hood. The Prototype 9 evolved into a skunkworks project as Albaisa’s fellow designers at Infiniti’s Atsugi studio in Japan began contributing ideas. Then, when managers at Nissan’s factory in Oppama saw a model of the car, they decided they wanted to turn it into real thing. “I was a little surprised,” Albaisa admits, “but it turns out they still train people in all the traditional car-building arts. They thought this was the perfect project, and they decided—on their own—to follow the design story as if [it were] real.” A team of takumi—Nissan’s master craftspeople—assembled to lead the build. Nissan’s advanced engineering team learned about the project and volunteered to help, as did Nissan’s specialty vehicle division, Autech. “Suddenly we had three of our largest departments working on it,” Albaisa says. Underneath that retro skin is an electric motor powertrain closely related to the one that will power the next-generation Nissan Leaf. Developed and tweaked by Nissan Advanced Powertrain, the rear-mounted motor makes 148 hp and 236 lb-ft and drives the rear wheels. That’s grunt enough, Infiniti says, to propel the 1,962-pound Prototype 9 to 60 mph in less than 5.5 seconds. Top speed is limited to 105 mph, down from a theoretical maximum of more than 130 mph. The 30-kW-hr battery pack stacked ahead of the driver should, Infiniti claims, allow for about 20 minutes of hard track driving. The juxtaposition of old and new is everywhere, both in terms of the Prototype 9’s hardware and the way in which it has been constructed. What look like old-school drum brakes behind the wire wheels are in fact housings around modern discs. The rotational dampers on the axles are conceptually similar to the friction shocks used in the 1930s, but they are electrically controlled. The steering is an unassisted recirculating ball system. The grid over which the aluminum tail cone was hand-formed is made of laser-cut steel. The one-piece hood was made using a process called dieless forming, using two seven-axis robots to shape the metal instead of two old-school metalworkers. 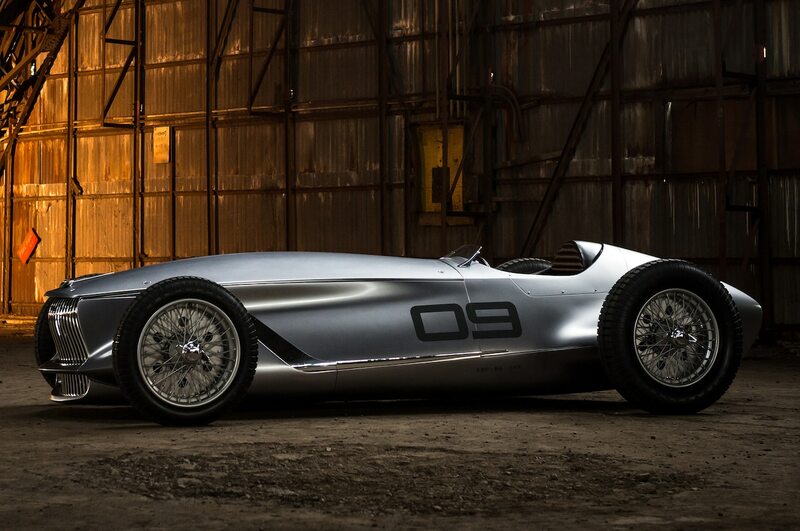 For Infiniti, making the Prototype 9 turned to be more than an intricate team-building exercise. It offered a mass producer of automobiles unique insights into the art of handcrafting one, and it has sown the seed of a fascinating idea: As mass-market automobility becomes the preserve of self-driving autonomous vehicles, could there be a market for what could best be described as “passion cars,” vehicles that have absolutely nothing to do with transportation and everything to do with the art and fun of driving? “That’s one of the branches of this,” Albaisa says. “The more our life becomes easier, the more our time to dream becomes richer. Why wouldn’t we make a hundred of them? Why wouldn’t we make a thousand?” Ironically, an EV powertrain—simple, compact, and the bête noir of automotive enthusiasts who believe their passion can only be powered by an internal combustion engine—actually makes building whimsical passion cars such as the Prototype 9 a lot more feasible.